*National Recommended Promotional Ride Away Price for models shown based on NSW delivery and with no other optional extras or colours other than those listed. Models with specification other than those listed may have a higher or lower price. Offer applies to motorcycles ordered and delivered between 1st April and 30th June 2019, at participating BMW Motorrad dealers. While stocks last. Cannot be combined with any other offer. Stock may vary between BMW Motorrad dealers. 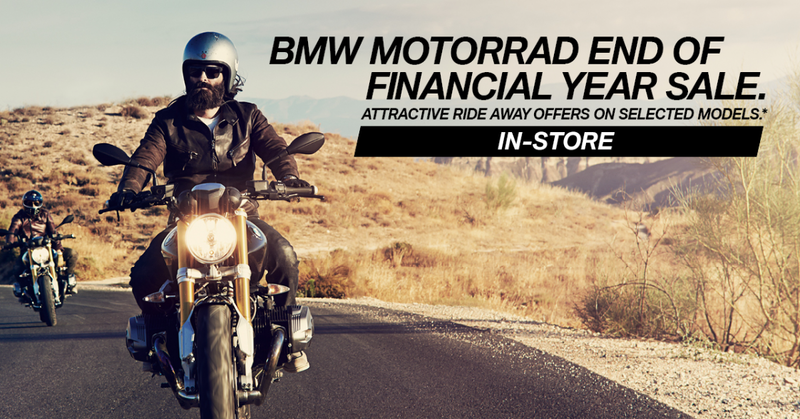 Price may vary according to individual circumstances and may vary between BMW Motorrad dealers and states/territories. Excludes fleet, government and rental buyers. Consult your participating BMW Motorrad dealer for further details. BMW Group Australia reserves the right to change or extend the offer.